Searching files with HoudahSpot is always case insensitive. This means that a search for “house”, a search for “House” or a search for “HOUSE” will return the same results. HoudahSpot does not distinguish between upper and lower case letters. If you need to run a search that respects the case, you can do this using the mdfind command in the Terminal app. HoudahSpot will help you with the Spotlight query syntax. 1. 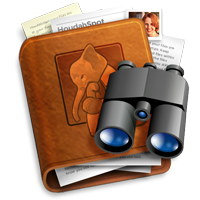 Set up your search in HoudahSpot. 2. In HoudahSpot, go to Window > Raw Query. Copy the contents of the Raw Spotlight Query window. 4. Type mdfind and paste your query, embedded in single quotes. – HoudahSpot’s “Name” searches by both display name and alternate names. – Search result for this query will include Houdah, houdah, HOUDAH, etc. 5. Before you run the search, make the following adjustments: remove the “c” from all the “cd” modifiers on all criteria for which you want to get case sensitive results. Hit return to run the search. – Search result for this query will include Houdah, but exclude houdah, HOUDAH, etc. The “cd” modifier tells Spotlight to ignore case and diacritical marks. Diacritical marks are glyphs added to letters. This includes french accents, german umlauts, etc. Therefore, you can also remove the “d” from cd to search for letters respecting their diacritical marks (> Häuser will only find Häuser, but exclude Hauser).